Forget take-outs! Make your own fried rice with this easy Chinese shrimp fried rice recipe. It is so much healthier and economical. What I love most about fried rice is how you can easily customize it with your favorite ingredients. I used mixed rice grains for this shrimp fried rice as it was what I had for dinner last night. Rooster and Piggy (my 2 girls) don’t really like mixed rice much so I tell them it’s a healthier choice. You can definitely use plain white rice too. Besides fried rice, leftover rice can be used to make congee. If you want a faster preparation time, use thawed frozen and peeled raw shrimps instead of fresh ones. They taste great too and are so convenient. Cooking fried rice is a very quick process and you’ll need a deft hand to cook the fried rice. Get all the ingredients ready and place them near your stove. The wok has to be very hot with a layer of oil over it so that the ingredients cook quickly and doesn’t stick to the wok. The high heat also dries out any excess moisture from the rice. I recommend using a stainless steel wok. A good quality stainless steel wok is able to take blazing hot temperatures for food to cook quickly. If you choose to use a non-stick wok/frying pan, don’t use high heat to avoid ruining it. The wok has to be big and roomy enough to stir-fry and toss the fried rice especially if you want to make a bigger portion. Day-old refrigerated rice works best for fried rice. Freshly cooked rice has too much moisture and will not separate well during cooking. However, if you want to use fresh rice, spread it out on a tray and place it under or near a fan to dry out some of the surface moisture. You can also leave it to cool in the fridge for at least 2 hours or until it is dried out. Less is more. Do not use too much watery seasoning or it will cause the fried rice to turn soggy. And that kinda defeats the purpose of using leftover rice. Don’t dawdle or leave the kitchen when cooking fried rice! The last thing you’ll want is burnt or overcooked ingredients. Seafood like shrimps cook very fast. Pay close attention and cook the shrimps till the outside changes color (the center can still be partially cooked). Then add them back to the wok when the fried rice is almost ready. With our busy lifestyle nowadays, I love meals that can be prepared quickly such as this shrimp fried rice. It takes just 10 minutes to make this delicious one-pot meal. Don’t want to miss a recipe? Sign up for Souper Diaries newsletter delivered to your inbox! Stay in touch on Facebook, Instagram, Pinterest, Twitter and Google+ for the latest updates. See you again and happy cooking! Quick, easy and tasty shrimp fried rice ready in 10 minutes. Heat up 2 tbsp of oil in a wok till very hot. Swirl to coat the surface of the wok. Add beaten eggs and do a quick scramble till it is about 70% cooked.Remove from wok and set aside. Heat up remaining oil on the wok. Add slightly more oil if needed. Add the shrimps and cook till they're about 70% done. Dish up and put them together with the eggs. Pour in the sesame oil. Add garlic and shallots and fry for a few seconds till fragrant. No need to brown. Pour in rice. Toss and mix to coat them well with the oil. Add mixed vegetables. Drizzle light soy sauce and sprinkle some salt over the rice. Toss the rice. Put the egg and shrimps back into the wok and toss frequently. Mix everything well. Fry till the rice is drier. Dish up and serve immediately. 1. Thawed frozen raw shrimps can also be used instead of fresh shrimps. Great, I have made fried rice at home before but your recipe seems to make it easier. I will have to give it a try you for sharing such an easy and quick meal. it’s great for busy days. Thanks for writing in, Pierre. If you enjoy easy and quick meals, you may also want to check out my quick soup recipes. Happy cooking! I love shrimp fried rice. Where I live in Oklahoma City, Ok. they have a restaurant that serves the best shrimp fried rice I have ever tasted. If I could cook any I would see if I could beat them with your recipe. You always have some good looking and sounding dishes. Thanks for sharing them. Looks so Yummy. Thanks for sharing this easy to follow recipe. Can I use Basmati rice or Jasmine rice for best results? I use Jasmine rice (either white or mixed grains) when making fried rice. As the texture of Jasmine rice is quite sticky, remember to wash away any dust and excess starch thoroughly before cooking. I haven´t known about using cold rice! Great advice! Thank you. Now I am able to do it. Guess what. I go and cook some rice now to try it this evening. I like that you add pictures with your recipes. You explain everything very well and make it seem very easy. That’s great. Hopefully next time the recipe will be vegan and I can cook it up at home 🙂 A lot of Asian food is and it is so delicious! Fried rice is probably one of the most common dishes but it’s also quite difficult to fry it well. The best fried rice I have eaten is fragrant, not sticky and I can actually taste the different ingredients all blended well into one great taste. Also, each grain of rice is covered with egg and very delicious. The chef is brilliant! I agree with you that a deft hand is very crucial to frying a good dish of fried rice. Do you have any tips on how to accomplish that? When using rice refrigerated overnight, do you heat it up first to soften it? Does it have better effect? Thanks for sharing. I have always loved Asian food, but rarely ate it outside of a restaurant. With your simple-to-follow recipes, I can see the possibility of enjoying it at home. Thanks for the many how-to pics! Oh wow. This looks really good! Like you said, you can easily customize fried rice recipes. So I will try this in quinoa instead of white rice. Im so excited! I love your site. I spent six months in Asia and I fell in love with their food. I have tried to re-create some of the dishes but it never tastes as good. Your article has been very informative and I love your photos. It really adds to the visual aspect. Is there any specific type of rice I must use for this recipe? Thanks for your kind comments, Celeste. You can use jasmine long grain rice, mixed grains rice or brown rice. 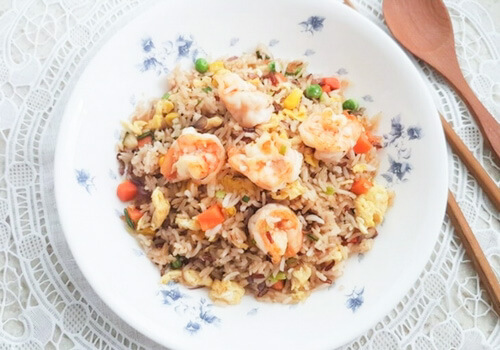 Thank you for giving me this information about Chinese shrimp fried rice.This so interesting as i always wanted to prepare rice in a different way, so I like the way it is prepared, I will follow the ingredients so that I will prepare this fried rice for Chinese and compared it to how i cooked my rice also. I personly enjoy curry very much. But it’s a bit difficult for me to make a tasty curry fried rice. It’s either too spicy or too flat. Could you help suggest some easy recipe to make a good curry fried rice? Thanks! I don’t have a recipe for curry fried yet. Did you use curry powder? If it was too spicy or too flat, most likely it’s due to the quantity used. After sprinkling the curry powder, mix everything well and have a taste. Add more curry powder if needed. Wow a really tasty meal in just 25 minutes. Thats my kind of a meal. Usually when i cook rice dishes I add it straight away to my meal after cooking. I am interested to see that fried rice is best after being refrigerated for at least 2 hours. That is new information for me. Any reason in particular why it is that way? Refrigerating the rice helps to dry out the grains and this will provide a better rice texture. Freshly cooked rice has too much moisture and will stick if you fry them. Day-old rice makes the best fried rice. 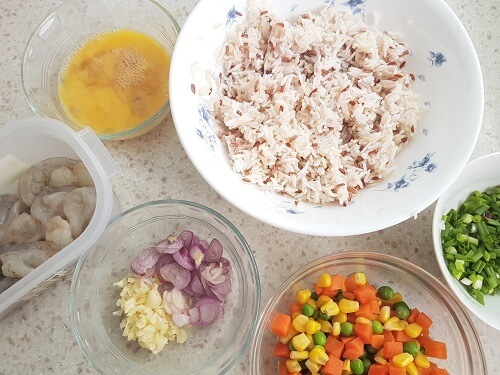 Usually, when I plan to cook fried rice, I will cook more rice than usual and save the excess in the fridge for next day’s cooking. Hope that helps. I love fried rice! My favorite is chicken fried rice with onions and asparagus or kai lan but shrimp fried rice is also delicious. I used to make this regularly as it was so convenient and I love that you can put whatever ingredients you have at hand into it. It’s easy to make and is a complete meal- protein, carbs and nutrients. Hello, Yvonne, this recipe is very special. At least, from where I come from it is unique and this is something much bigger than you think. Chinese and Asian recipes are becoming something other parts of the world are yearning for. 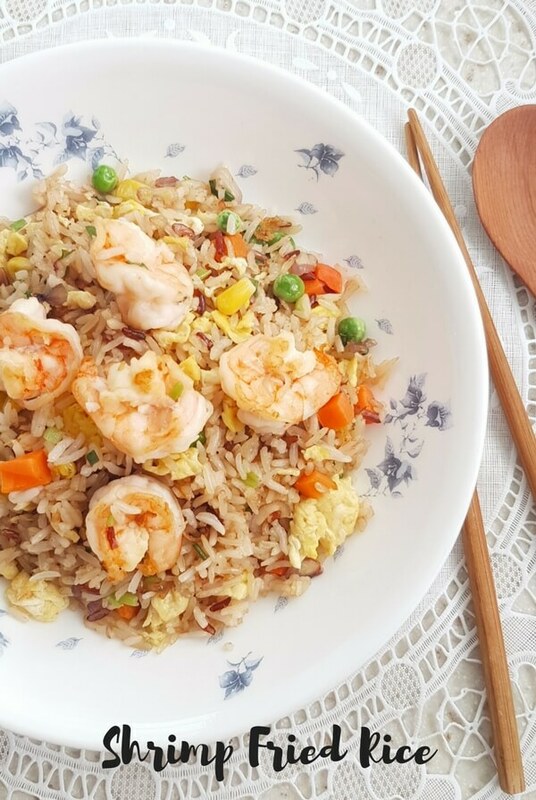 I must say that your Shrimp Fried Rice recipe is quite amazing and yummy even though it is even cheaper to prepare. Every food loving person ( who doesn’t love food?) would love your website because this is the food itself. Keep up the good work because I will be visiting often to see more of your new recipes. Man I shouldn’t have read this when I was hungry, now I’m starving! I love making fried rice but have never done it with shrimp. I also love cooking with sesame oil, something about that nutty flavor I love! What about black pepper or other seasonings for this recipe, would that be OK?